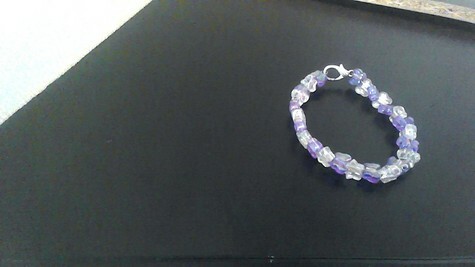 Purple and white transparent butterfly and star beads 6 inch clasp bracelet. A FUN & STYLISH ADDITION TO YOUR FASHION JEWELRY COLLECTION! Purple Butterflies, Stars, White Butterflies, Stars,Transparent beads on a silver-plated wire, silver-plated big-clasp bracelet.